Just wondered if anyone had any experience of companies that will visit you on-site to replace caravan tyres, does such a service even exist? My father-in-law seems to recall a company that would come to you on-site and get them changed, possible Happy-campers, although a quick search isn't giving much away. Er, Kwik-Fit, Tyres on my Drive two mention but two? I used mobile Kwik-Fit at my house a couple of years ago. Very good service and competitive pricing. I can't see why they wouldn't attend a work address. I've used Tyres On The Drive to fit my caravan tyres at storage, and my mate has used them for car tyres at his office car park. I seem to remember that they simply ask you to ensure that there's enough room to work safely, ie to jack up the vehicle and remove/replace the wheel. Excellent service by the way, and very competative prices. If you have Kwik fit to fit tyres just check the date they bring. We should of had new tyres last Monday, they turned up as arranged but when I queried the date on tyres he was going to fit week 12 - 2017. I explained it is 5 -6 years from manufacture not date of fitting. He arranged to come back 2 days later but had to cancel as they had no later tyres and Kwik Fit are processing a full refund. I have now found another company who are coming out tomorrow Weds 7th March with tyres dated January 2019. The company coming out tomorrow is Home Tyre and they are £20 cheaper than Kwik fit. They have guaranteed the tyres will be this years. I explained that caravan insurance and caravan club recommends tyres to be changed every 5 to 6 years from manufacture date and if I had the Kwik fit ones they would of been 2 years old when fitted. Home Tyre say they cover Edinburgh to Brighton - and whilst they cover Sheffield they don't cover Leeds, Bradford, or Nottingham for example. Really useful, I wonder how many forget to check and assume they are relatively new. I explained it is 5 -6 years from manufacture not date of fitting. I always believed that tyres stored properly would not deteriorate within reasonable periods (say a couple of years) and that the estimated life started from date of fitting. In practice yes, but who, other than the vehicle owner at the time knows the actual date of fitting? Anyone else can only go by the date marked on the tyre. Yes, that's what Michelin say. 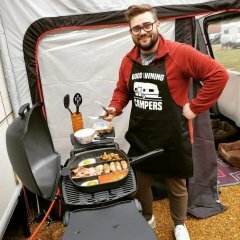 The first trip I went on with my campervan last year a friend came with us in her van. She had a blowout on the way and her tyres were 10 years old. So I checked mine and the rears were original, also 10 years old. I 'persuaded' the dealer to swap them for new, though he protested that there is no time limit on tyre life in the MoT test, only tread depth and overall exterior condition. I pointed out the recommendation for caravan tyres and he said that was for caravans, not other vehicles. That seemed like an unhealthy attitude to me. Indeed I read something recently where the issue was raised with Mr Grayling's Department and they said they were consulting on the issue. I well remember the clubs recommending 5yrs when the manufacturers said 7yrs, people on forums then getting down to three and even two!! At the time and in responce to this silly state of affairs, the manufacturers removed reference to age, substituting 'regular inspection,' (from day one), as the only way to ensure tyres remain fit for purpose. How then this silly argument still exists today is totally beyond me?! 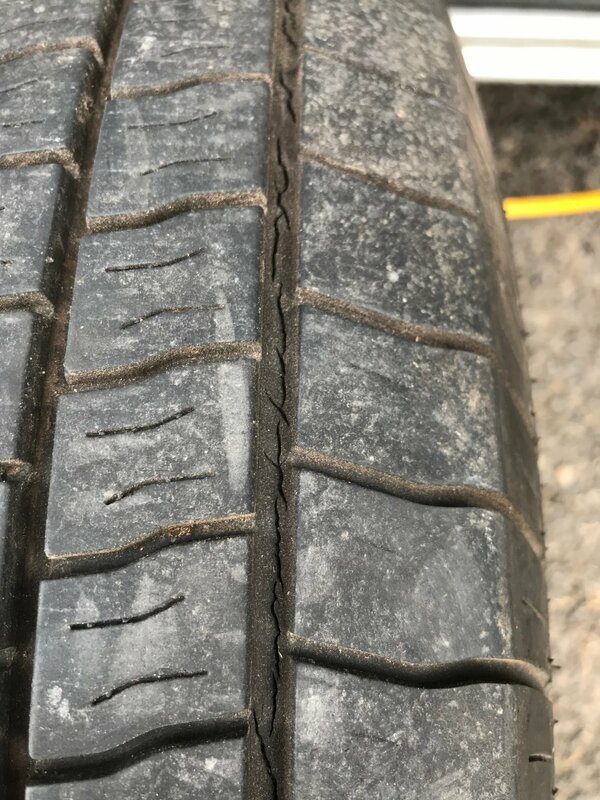 Tyres certainly need inspection regularly on caravans as they can get kerbed easily without any knowledge and they are left for months stationery we have also had members that have found cracks in sidewalls at 14 months . I always changed mine at 7 years max . Not here where I live, to get the 100 Km/h Sticker (and to drive within it's legality) one of the things you must have fitted are tyres that are no older than 6 years from the production date. You can legally continue to use them but you are then restricted to 80 Km/h. That's what they say John but can we be sure they've been kept and stored properly, I changed my back tyres on the car because of severe cracking at 3 years, with the caravan, although I keep an eye on them I change at no longer than 5 or 6 years, depending on where I'm going. National tyres did mine and they were 3 months old, they also balanced without question. The one thing I did often discover at the scene of a “fallen over” caravan (usually due to tyre failure, but that’s another thread!) was the worrying number of caravans that we’re fitted with car tyres. They were the same SIZE as the originals, but often of a much lower load rating, not to mention just how ancient some of them were. 10+ years was certainly not uncommon. Frightening isn’t it?? Maybe there IS an argument for caravans to have a (simplified) MOT. Last year prior to a 2,200 mile Euro trip I decided it best to renew the van tyres. They were 7 years old but walls and tread depth looked ok.
Just got my new caravan a couple of weeks ago and tyres are week 09 2017. An interesting conversation to be had with the supplying dealer then! The trouble is that there is nothing in any legislation covering the age of tyres fitted to any new vehicle so unless the dealer wishes to “play ball” there’s not a lot you can do. When I bought our 2010 Pegasus last year the tyres that were on it were stamped 2009. I raised the issue with the dealer and they said they always inspect the tyres but will only replace them free of charge if there are visible cracks or degradation. They wouldn't be moved on this, but as the van was in such a nice condition with no damp, I checked, and a very reasonable price compared with some I'd seen advertised, I bought the van. The van was fitted with new tyres, paid for, before we collected it. No won't be doing that it is brand new but a 2018 model and not made for anymore so no 2019 models. If this one had been sold in 2018 it would not seem too bad would it, maybe up to half as old. I'm trying to make the point not to count the life from when you bought a new caravan. For a new caravan I think the tyres life could be getting made and then bought by chassis maker who stocks and puts into a chassis build. Then at some later time sells it to a caravan maker, who some time later builds a caravan on the chassis, some more time later sold and shipped to a dealer who supplies it to a customer. The tyre will be over a year old by now. I did a deal with my dealer who wanted rid so he could a 2019 in its place on display.